Representatives from the Karen National Union’s central level and from seven districts together with other observers made it to Lay Wah (also known as Law Khee Lar) in Pa-an district Karen State to attend the 16th Congress that started today, March 14, 2017. 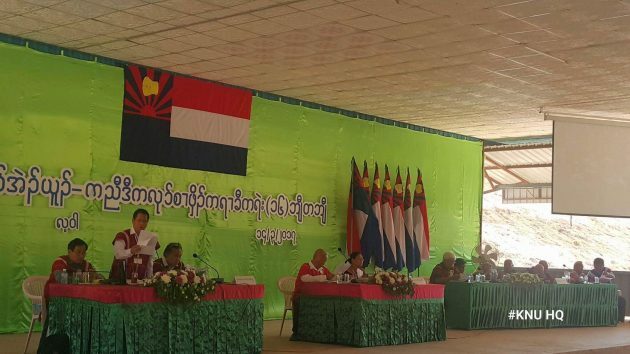 The KNU representatives and observers from the Karen political parties, Karen armed groups and Karen civil society groups from both inside Burma and from overseas – a total of 318 people attended the 16th Congress. After it was postponed from November, 2016, to March, 2017, the 16th KNU Congress was held on the rescheduled date. The first day of the Congress started with activity reports that were then discussed among the congress attendees. The organizing committee expect the congress to last for three weeks, as review of works implemented during the last four years will be evaluated and future work plans will be set. The three-week long congress will also elect its new leaders, the most important and eagerly awaited component of the Congress. The 16th KNU Congress is chaired by its Chairperson General Mutu Sae Poe and Vice Padoh Naw Zipporah Sein and its three secretaries; Padoh Kwe Htoo Win, Padoh Thaw Thi Bwe and Padoh Mahn Mahn act as facilitators.